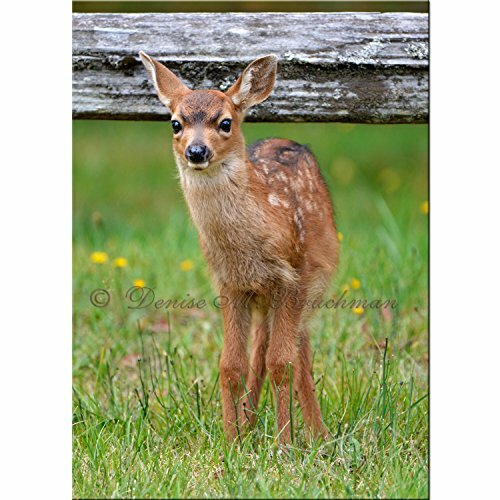 Spotted Baby Deer Photo - Spotted Fawn Photo - Photos Baby Animals - Photos Baby Deer - Nursery Art - Kids Room Art - Deer Photos by Denise Bruchman Photography at Animal Backgrounds. Hurry! Limited time offer. Offer valid only while supplies last. This is a brand new photo that I just captured! I was headed to the beach when I saw this little guy next to this split rail fence in someone's yard. This is a brand new photo that I just captured! I was headed to the beach when I saw this little guy next to this split rail fence in someone's yard. I quickly found a place to turn around and managed to get a few shots before he decided to toddle off into the safety of the yard. This unmatted, unframed photograph is available in the following sizes: 5"x7" 8"x10" Printed on: Gloss finished, archival quality photo paper Printed with: Archival quality photo inks Shipped: Flat Mat, frame, and watermark shown are not included with the finished piece.